Editor’s Note: By the time you read this summary of the legislative session for 2018, it will have ended as of March 9. Please be aware that many of these proposed bills may not even make it to the floor of the Legislature. 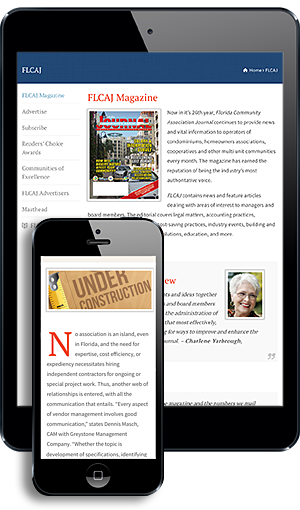 The new year brought forth a flurry of bills proposing to change how Florida community associations operate. Some bills appear to clean up errors of the past. Some bills appear to be knee-jerk reactions to a constituent’s complaint. Many proposals just leave observers shaking their heads. This year may be more interesting than most as it is an election year. Many in Tallahassee are vying for re-election or seeking to “move up” into the many open local and statewide positions. You will note after reading just a few bills that many provisions are contradictory. Some just “do not make sense.” As in past years, it is likely that most of the proposals will not survive committee review, never making it to the floor of the Legislature, and even then there may be bills that die on the floor. One of the first bills filed to address Florida community associations mandates condominium and homeowner associations to adopt and review no less than every three years a policy prohibiting bullying and harassment. The bill seeks to define both, outline penalties, and mandate reporting procedures and “a description of the type of behavior expected from each association member.” Results of mandatory investigations are to be reported to the state of Florida. Concerning homeowners associations: mandates an annual report; holds managers responsible for denying owners access to records; allows any fine to be a lien; extends the time for transition/turnover for developer control; reinstates mediation for election disputes while changing the qualifications for mediators; provides the Florida Department of Business and Professional Regulation investigation and education components; allows prospective purchasers access to certain association documentation; and provides for claims by owners against developers of new communities. Creates a separate division for arbitration; addresses the authority of arbitrators to issue show-cause orders to directors and officers and to enter sanctions for certain intentional wrongful acts, rescinding from the Homeowners Association Laws the mandatory pre-suit mediation program and transferring disputes to a division of community arbitration. Prohibits homeowners associations from hiring an attorney who also represents the association’s management company; requires bids to be kept as other financial records; provides renters the right to inspect bylaws and rules; requires by July 1, 2019, a website to be populated with documents similar to the requirement for condominium associations; mandates financial reports to be provided without charge within five business days of a written request; prohibits the use of debit cards; rescinds the board of directors’ ability to contest a recall; requires a recalled director to turn over records within ten business days; criminalizes kickbacks; creates a good faith threshold for officer and director conduct; requires a notice of delinquency 30 days before voting rights are suspended; creates eight year director term limits unless the members by super majority vote override or there are not enough candidates; prohibits directors and managers from purchasing a communities parcel at a foreclosure sale; prohibits contracting with service providers owned or operated by a director or officer or a family member; and, mandates disclosures of conflicts of interest by directors and officers. Rescinds the prohibition on an association hiring an attorney representing its management company; deletes the seven-year limitation on keeping minutes and reinstates a one-year retention period for bids and otherwise requiring records to be perman-ently maintained from inception unless otherwise permitted for a seven-year period; expands the bids required to be posted on the association’s website once a $2,500 threshold is met; and rescinds the four consecutive two-year director term limits. Permits a summary notice to protect homeowners association covenants from extinguishment under the Marketable Record Title Act; revises revitalization of covenant procedure; and mandates boards of directors consider preservation notice at its first meeting of the year. Rescinds the condominium association prohibition on retaining a management company’s attorney; deletes the seven-year limit on retention of minutes; revises bidding information to be posted on a condominium association’s website; reduces the minimum number of directors to three for small condominium associations; restates assessment notice requirements; mandates rule making for electronic notice of meetings; rescinds term limits though mandating no term may be beyond two years; mandates notice posting requirements, electronically and physical; permits a director who has been subject to a recall to petition to challenge the recall; provides that when a director is removed subject to the challenge and allows for an award for attorney’s fees; requires hurricane shutter votes for approval occur before commencement of the work; and revises the fine process including extending limitations as who may serve on a fining committee. Cooperatives: extending many of the same changes proposed for condominium associations and for cooperatives adding prohibitions on service as a director if assessments are more than 90 days delinquent; expanding cable and communication services contracting authority. Homeowners associations: revising fining procedures and election procedures if there are not sufficient candidates for a contested election. Seeks to clarify fire sprinkler retrofitting requirements and providing for signage for buildings that do not have fire sprinkler systems. As occurs every year, there are more bills that impact all of our lives, including those portions of our lives that address community associations. These include bills that seek to impose personal liability upon contractors who do not have mandatory insurance coverage (HB0089/SB0604), limit when claims may be brought for construction defects (SB0536/HB0875), mandate specific notice requirements pre-suit for construction claims (SB0680/HB0759), and create penalties for fraudulent notices of non-payment of a construction bond (HB0723/SB0908). Chopping Down Trees Without Association Approval? Florida community associations are proud of their beautiful landscaping. What happens if an owner cuts down trees on the owner’s property without obtaining association approval? Can the owner be held liable for damage to the association’s landscaping scheme? It may depend on what the community’s restrictions provide, requiring careful reading and perhaps an amendment before filing suit. A Florida appellate court recently addressed the issue of whether an association’s restrictions required a unit owner to obtain written consent from the association’s board of directors before altering the landscaping appurtenant to his units. The appellate court ruled that the unit owner was not required to obtain the association’s approval before removing very expensive palm trees. The facts in Waverly 1 and 2, LLC v. Waverly at Las Olas Condominium Association, Inc., 42 Fla. L. Weekly D 2569 (Fla. 4th DCA, December 6, 2017), indicate that the owner of two commercial units at a mixed-use condominium removed two $18,000 canary palm trees located next to the owner’s units without prior written approval from the association. Because the owner removed the trees without the association’s approval, the association sued the owner for unauthorized modifications to the property’s landscaping scheme. The trial court found that the landscaping was a common element of the building and entered judgment for the association. The appellate court found that owners of commercial units were not required to obtain association approval before altering the landscaping next to their units. The court pointed out that if the association wanted to prevent commercial unit owners from altering the landscaping next to their units, it should be “explicitly” stated in the declaration. This decision should remind associations of the potential problems that can arise from unclear language in their association documents. If a use is to be prohibited, then normally that prohibition must be stated clearly in the documents. The true test may not be until decades later. Contact your association’s counsel if you have any questions regarding restrictions and amendments. What do you do with “stuff” left behind following a foreclosure or tenant eviction? This does happen, even in communities. The Florida appellate court reversed the dismissal of the conversion claim. The appellate court noted that conversion “constitutes the exercise of wrongful dominion and control over the property to the detriment of the rights of the actual owner.” The court explained that once the property was placed in the parking garage, the association had no right to require the owner to give the property manager items of property as a “quid quo pro” for access to recover the rest of his property. “The allegations are quite clear that Mr. Ice did not abandon his remaining property, but instead made numerous and repeated demands and efforts to recover that property,” the court stated. Michael J. Gelfand, Esq., the Senior Partner of Gelfand & Arpe, P.A., emphasizes a community association law practice, counseling associations and owners how to set legitimate goals and effectively achieve those goals. Gelfand is a Florida Bar Board-Certified Real Estate Lawyer, Certified Circuit and County Civil Court Mediator, Homeowners Association Mediator, an Arbitrator, and Parliamentarian. He is a past Chair of the Real Property Division of the Florida Bar’s Real Property, Probate & Trust Law Section, and a Fellow of the American College of Real Estate Lawyers. Contact him at ga@gelfandarpe.com or (561) 655-6224.